Staff from the Sandia Mountain Natural History Center (SMNHC) recently launched their work to analyze local water quality through the EarthEcho Water Challenge. As recipients of an EarthEcho Water Challenge test kit donation, staff is equipped with the tools needed to collect critical water quality data while learning about their local waterways. This is done during educational outreach where the staff of the SMNHC meets students at a “wild” area near their school and leads them on a nature hike, interpreting the natural surroundings to explain how all the parts of an ecosystem are connected. Using the outdoors, each program starts by teaching students about the inter-connectedness of the biotic and abiotic parts of an ecosystem with a hands-on scientific approach. Students are introduced to the local ecosystem, and producers, consumers, and decomposers that reside here, through a day of field exploration, scientific observation, and hands-on learning in the outdoors. All lessons and activities are aligned with the New Mexico State Science Standards, Next Generation Science Standards and the Common Core State Standards for 5th graders. Outdoor teaching areas require hiking trails, restroom facilities, school bus access, and a parking area. Areas that have been used for the TEFP include State Parks, National Park Service sites, National Forest campgrounds and picnic areas, BLM land, and natural areas within walking distance of the school. 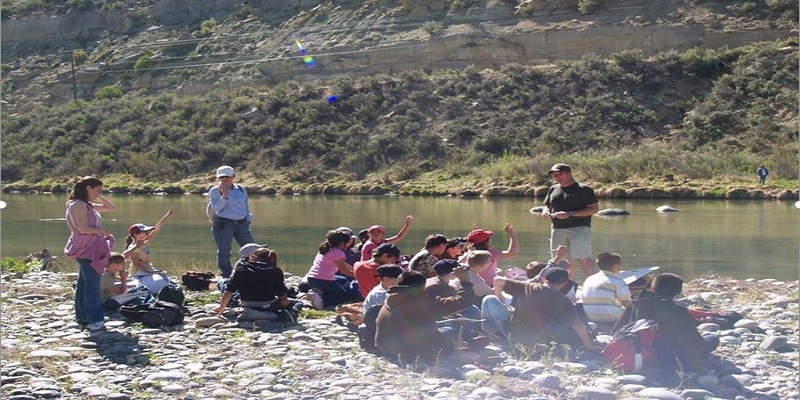 For schools in the Los Lunas/Belen area, we teach our Ecology Field Program at Whitfield Wildlife Conservation Area (WWCA) in Belen. This is one of many areas that will be tested by students in New Mexico. At WWCA students are led on a flat hike through the Bosque ecosystem, learning about and closely observing cottonwood trees, a pond/water channel, Sandhill cranes and other birds, native/non-native species, consumer evidence, and ecosystem restoration projects. This is one of the many types of waters that have been or will be tested by SMNHC in conjunction with a local school including: the Rio Grande River, small rivers and streams running through a canyons, lakes formed by collapsed caves, groundwater wells, natural springs, lakes, and ponds. While using the EarthEcho Water Challenge test kit, students are taught about water quality and testing processes in the field. After becoming comfortable with the water testing procedures, the classes from schools throughout New Mexico then test their local water with SMNHC staff. Through their testing they are able to compare water quality data from different portions of the water bodies, noting variations in data. All data is then discussed with students and recorded by the SMNHC staff. During the fall of 2017 the following areas have been tested: Navajo Lake State Park, Bluewater State Park, and Bottomless Lakes State Park. Staff with SMNHC will return to test site(s) in the spring of 2018 to take additional water quality measurements with different classes and schools. Thanks to the students and staff from Sandia Mountain Natural History Center, one of our 2017 EarthEcho Water Challenge Test Kit Donation Program recipients, for their participation in the EarthEcho Water Challenge and commitment to protecting their local waterways. Interested in applying for an EarthEcho Water Challenge Test Kit Donation for your class? Learn more and apply here. A special thanks to Xylem Watermark for making our Kit Donation Program possible!